I’ve been complaining recently in some of my posts that I’m sick of movies featuring winter and snow. So thank the lord for A Bigger Splash which is set in summertime Italy. But will the warmer setting be the only bright spot? Rock star Marianne (Tilda Swinton) and her lover Paul (Matthias Schoenaerts) are enjoying a holiday in Italy as Marianne recovers from surgery on her throat. However their quiet holiday is thrown into chaos when an old friend (and ex lover of Marianne) Harry (Ralph Fiennes) and his daughter Penelope (Dakota Johnson) arrive unexpectedly. I was worried that this movie would be a pretentious story about rich people on holiday moaning, however this feeling was largely subsided as the film started. I found the dynamics of the four characters really interesting as the various relationship develops while resentment and conflicts deepens. Throughout the movie your eyes are completely drawn to Finnes, no matter what else is going on in the scenes. His Harry is a whirwind of energy and is a mixture of the best holiday companion and the worst. Finnes physicality is great, the scenes of Harry dancing about to music is one of the best scenes of the film-even though it’s simple, it just sets up his character so much. His love for music and how he’s a whirlwind of desire and passion. Swinton is also mesmarising, able to convey her emotions even though her character can barely speak above a whispher. Johnson is also impressive as the sensual Penelope. I found her to be the most intreaging character as I was never quite sure what she was thinking or what her motives were. Schoenaerts’ Paul is the weakest of the four and the least interetsing. But the four work well together in their different dynamics. The film works best when the story is simple and the scenes are just of the characters conversing with underlying tension. As the movie tries to force the plot and add a dramatic moment the film becomes less engaging in it’s final act. Imagine you’re Sam Mendes and you have to make a James Bond movie to follow the critically and commercially acclaimed Skyfall, how on earth do you top that? 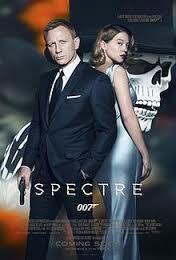 By making one of the most expensive movies ever made and paying homage to previous Bond films it seem. But did the gamble pay off? After an unoffical mission to Mexico makes headlines, James Bond (Daniel Craig) is suspended by M (Ralph Finnes). But that doesn’t stop Bond from trying to find out about Franz Oberhauser (Christoph Waltz) and his mysterious organisation that’s been behind several acts of terrorism around the world. Teaming up with Dr. Madeline Swann (Lea Seydoux) Bond attempts to track them down before their latest plot is unleashed on the world. Lets get this out of the way. Spectre is not as great as Skyfall but it’s still a pretty good effort by Mendes. The opening scenes set in Mexico during the Day of the Dead celebrations are brilliantly staged with some lovely tracking shots of Bond working his way around the celebrations to track his target. The cinematography is also excellent with the whole film looking as stylish as you’d expect a Bond film to be. In his fourth outing as Bond, Craig is still suave, with hints of danger and unpredictability underneath. It was also fun having the gang back together especially Ben Whishaw as Q with his dry sense of humour as he gets embroiled in Bond’s schemes despite the risk to his job. It’s just as shame that for most of the film the team at M16 are separated from Bond. More teamwork next time would be great. Christoph Waltz makes a good first appearance as Franz Oberhauser, hiding in the shadow until he draws his direct attention to Bond, but his subsequent scenes are frustrating as he keeps making the same mistakes as previous Bond villans in not killing Bond when he has the chance! His reasoning for his hatred of Bond is also rather underwhelming. Meanwhile Lea Seydoux does a capable performance as Dr. Madeleine Swann but is not as memorable a Bond girl as say Eva Green’s Vesper Lynd. It’s also a shame that Monica Bellucci’s role as Lucia is short as she seemed quite good and her character was interesting. Some of the nods to previous Bonds are fun but at other timers it overwhelms the film leaving it with little identity of its own and more like Bond Greatest Hits. It’s also way too long and dragged a little at times. There are rumours around that this is Daniel Craig’s last outing as Bond, and if so he may not leave on an ulitimate high like Skyfall but it would still be a fitting end to his Bond era. When I first saw the trailer for this film a couple of weeks ago I came to the realisation that I have never seen a Wes Anderson movie. I was sure I had but as I looked at his list of films I realised that for some reason I have missed his collection of work. So to amend this I decided to give The Grand Budapest Hotel a try. Set in the fictional Republic of Zubrowka in 1932, Gustave (Ralph Finnes) is the conierge of The Grand Budapest Hotel, and when he’s not attending to the hosts guests he is seducing wealthy elderly ladies. When one of these ladies Madam D (Tilda Swinton) dies Gustave finds himself framed for her murder. With the help of his lobby boy Zero (Tony Revolori), Gustave wants to prove his innocence and keep Madam D’s prized possession, a painting called Boy with Apple, away from her greedy family. I had heard about this film previously but I wasn’t interested in watching it until I saw the trailer which was hilarious. Although I was concerned that all the funny moments may have been compiled into the trailer and the rest of the film could be a dud. Thankfully this is not the case. The Grand Budapest Hotel is continuously laugh out loud funny, from the funny script to the comedic timing of its actors. This movie also looked amazing, with brilliantly detailed sets and scenery. It was easy to get lost into the background with such intimate detail given to the locations, however the story was enthralling enough to bring me back to the action. The Grand Budapest Hotel itself looks spectacular and is almost like another character in the film. Anderson has put together a brilliant cast. There is also a number of great cameos-too many to mention. As the concierge Gustave Ralph Fiennes took me by surprised by how funny he was. I guess I’m so used to seeing him in serious roles as Nazi villains, Shakespearean anti-heroes and Voldermort that I didn’t really know how great at comedy he was, whether it’s the physical aspects of his role or the delivery of his lines, he nails it all. Zero the lobby boy is also an adorable character with his drawn on mustache. He is the heart of the film and the film lovingly shows his loyalty for Gustave and his sweet romance with Agatha (Saoirse Ronan). Although this film is essentially a comedy I was surprised by the serious tone the film would have at times. There was a lot of sadness beneath the farce, especally towards the end. There was plenty of nostalgia for people, places and the last remains of humanity in people. This change in tone may not be to everyone’s taste but I think it helped give depth to the film. I don’t know how this compares to other Wes Anderson movies but if they are as enjoyable as this one I look forward to watching more.